A common refrain of people fascinated by the innovation of a product is to ask, “What will they think of next?” The answer, according to Häfele America Co., one of America’s leading suppliers of furniture and architectural hardware components, can be found in booth W729 of the 2017 Kitchen and Bath Industry Show (KBIS) January 10 through 12 in Orlando, Florida. There Häfele will demonstrate that they lead the industry with style, innovation and an unparalleled commitment to inspired functionality. The design of the Häfele booth will immerse visitors in kitchen, closet, mud & laundry, bath & vanity and closet vignettes giving real world examples for how the company’s products can be incorporated into customer projects and bring real, tangible value. Booth partners contributing to the display include industry leaders such as Bright Wood Works, Inc., Interlam, EFI, Goodwin Company and Miele USA, which will showcase its sleek, new Obsidian Black range of built-in appliances. 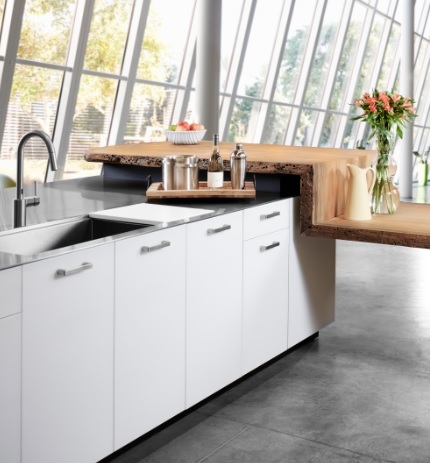 The newest addition to Häfele’s tremendously popular line of Fineline kitchen organizational solutions, Fineline Kitchen Accessories will be debuting at KBIS 2017. This series of products extends the character and personality of the Fineline range by combining warm woods with stylish metal finishes to create something boldly unique. Entirely exclusive to Häfele, Fineline Kitchen Accessories are available for a variety of blind corner cabinet solutions and pantry pullouts. Also being shown is the all-new Fineline LAVIDO which brings additional sophistication and functionality to Häfele’s top-selling LAVIDO pantry solution. Häfele’s Loox LED Lighting system continues to redefine the placement, use and wow-factor in lighting. Fully flexible and customizable, Loox is specifically engineered for efficient task, accent and ambient lighting with a wide range of surface and recess mounted lights, flexible strips and flexible silicone in warm and cool color temperatures. Switching options for the Loox line are the stuff of science fiction novels: fully programmable systems attached to a remote; infrared, motion detection operated lights within drawers and cabinets as well as fixtures which turn on, off and dim with the wave of a hand—including capacitive switches which are discreetly hidden in casework. You have problems and Häfele has solutions. That ethos will be on full display at KBIS 2017 with a wide range of remedies for your most pressing issues. Reduce clutter and charge those thirsty devices with Docking Drawer, an innovative charging solution which can be ordered in standard and GFCI varieties. Let’s say you need space in the kitchen. Your cabinets should open up, instead of out—Häfele’s Free family of flap fittings can help. How about a cure for the common closet? The ENGAGE Closet System offers amazingly chic and dynamic accessories like shoe racks, folding stations and lockable drawers on full-extension, soft closing slides. And installers will love the system because components come ready to install right out of the box. Here at Häfele, we know that the inside of a drawer can be just as beautiful as the outside. This is why Häfele is so committed to providing amazingly versatile and exceptional functional hardware solutions. The all-new MX drawer system from Häfele features tool-less adjustment that’s easy to maintain with styling that’s easier to love. The Grass Vionaro drawer is an ultra-sleek drawer box system mounted on synchronized Grass Dynapro slides that commands attention and performs flawlessly. To discover how Häfele inspires design by thinking ahead, visit Häfele in booth W729 at KBIS 2017.